Even though Gweneveer seems to have developed an aversion for driving towards water we have decided to lead the bull by the horn and make her over come her fear. However as we approached the town she had previously broken down in, the hearts were racing with fear it might happen again, thankfully she sailed past and we began to relax. 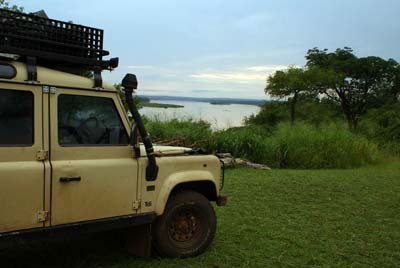 We were heading north to Murchison Falls National Park, where there is one of the world’s most powerful waterfalls. As we had to do a few jobs in Kampala before we left we were not able to make the distance in one day, especially when we chose the long way to the park and the roads deteriorated. With options for camping rather limited before the park we were really pleased to get to an area perfect for wild camping. Surrounded by nothing other than dirt and wild flowers we setup camp. Not having done it for a while, Steve was a little nervous again, though once night fell and we were tucked away in our home everything seemed perfect. Doing yet another sneaky entrance to a national park we quickly went into Safari mode, armed with the mammal and bird books, our eyes begin darting frantically from side to side looking for that elusive animal. This normally results in Steve driving into every pot hole, making lots of noise and then scaring off animals with the squeaky breaks. Over 30Km had past in the park on the way to the falls and all we had seen was some Buffalo, making us a little deflated and wondering how they can call it a National Park. Any disappointment was quickly lost when we finally got to the water fall. 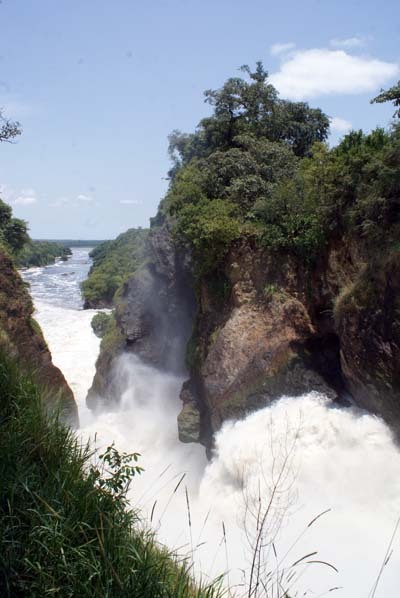 The white water caused by the sheer volume of the Victoria Nile River tries to force itself through an incredibly narrow gap compared to how wide the river is. A bit like some women try to squeeze into trousers 2 sizes smaller, it causes a billowing effect. However the natural version is far more beautiful and impressive with water and mist souring into the air as the water plummets down the chasm and is propelled back up high against the sparkling rock. As you stand above the falls, only metres away from guaranteed death you can’t help but be mesmerized at how fascinating the sight is. Having messed up the timing of everything we found ourselves at camp at around 3pm as we didn’t want to brave the river crossing to where the animals are, because of the lack of ticket. Instead we were limiting ourselves to the boat ride in the morning before leaving the way we came. Unfortunately no boat trips were running so we were granted permission to be in the park till the end of the following day so we could take a boat trip. This meant we had to use up time in the morning, the only option to go through the gate and across the boat to the northern shore of the river. After a story of losing the ticket out the window as we drove along, the guard let us through, of course we did explain how else do you get in the park otherwise! 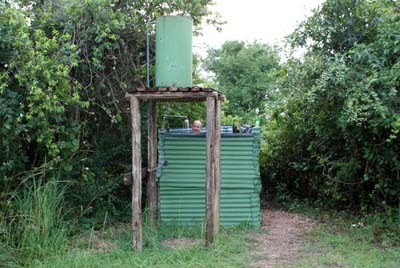 Thankfully we were treated to much more game and elephants this side of the river, though no cats. Now we both have a slight confession to make, we seem to be closet twitchers. Not to the point that we spend hours in hides just waiting, Katie does not have the patience for that, but we do eagerly flick through the bird book trying to identify what we see! This was highlighted by the fact our favourite animal we saw that morning was the Grey Crown Crane (the national bird of Uganda.). It is the same with the antelope we can identify 12 different species, often sat discussing the finer points of why it is that antelope, due to some slight deviation in markings, colour or shape. This often causes confusion to others who rush over to see what we have discovered, only to find it’s a herd of Kob or some Topi. We would encourage anybody to give more attention to the varied spectrum of birds on safari (though only the interesting looking ones) as it has certainly added a new element to our safaris and everyday driving. With our bellies empty, as Katie got our bread stolen by a baboon (again! ), we caught our boat cruise up the river. We were amazed not only at the quantities of hippos, birds and crocodile but also the amount the guides knew about the different animals. The boat ride was a lovely way to while away a few hours, even with a thunderstorm that seemed to soak most other passengers causing chaos as we tried to get the sides of the boat closed. Unfortunately the boat does not get as close to the waterfall as it shows in its publicity photos, leaving us a little disappointed. We now wish we had done the walk down to the bottom of the falls the day before. The road south from Murchison Falls is even worse and slower, the 285km journey we had to cover down to Fort Portal was impossible to do in a day, especially when we chose the small road option. We stopped in one village to pickup some drinks and snacks for lunch, but when Katie returned to the car a few minutes later the car was surrounded in a swarm of children. Not forgetting the one police officer at the window finding out about us and borrowing the snake! Once Katie had fought her way through the four children deep wall around the car she decided to try the usual entertainment, whilst we finished our drinks. Though with so many children it was a bit overwhelming and not so easy, still, being a white person seems interesting enough for them. 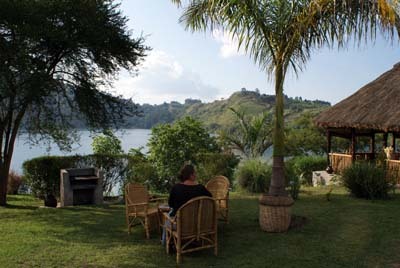 We had decided to treat ourselves to a rather posh campsite by Lake Albert overlooking the Democratic Republic of Congo. Unfortunately it was the only option in the area so more of a necessity than a treat, though lounging about by the swimming pool was a little slice of luxury. As the sun set over the lake it began glistening with lots of magical lights spread across the entire lake. It was hard to believe that they were all created by hundreds of little dug out fishing boats, the lights attracting the fish. Unfortunately it does mean with so many people fishing they not only over fish the lake but they only make about 5000 shillings (£1.60) a night, per boat. 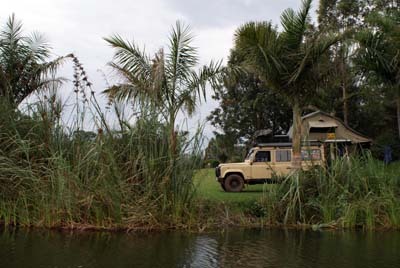 Having found the most amazing campsite at Fort Portal we settled in for two nights of pure amazement. The evening thunder and lightning shows were astonishing; the sky actually looks like it is dancing with the number of lighting strikes that illuminate the sky from almost a 360 degree view. The campsite was set above a small crater lake in the most picturesque landscape, with little farming fields creating a patchwork colour affect over the hills. It has been the only place on the trip we could see ourselves living. Luckily we don’t have the budget or Katie would have found a way of buying some unused land near the campsite and building her dream home. However we would not employ the gardener who had a wonderful way of waking us up before 7am by cutting the grass right by the tent. All they use is a medieval looking device that is nothing more than a piece of metal with a flat headed blade, attached at 70 degrees, that they just rhythmically swing side to side slicing the grass. Outside capitals is always trickier to get what you need, for us it was finding some extra cash, but for some reason our cards seem to be failing us at certain banks. 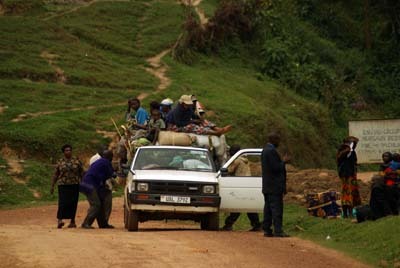 Instead we thought we would spend some in the Fort Portal market. Markets are always interesting places to visit, with stalls crammed in to muddy rows all selling exactly the same. As we wandered around we stumbled upon the butcher area, instantly wishing we hadn’t as we were presented with umpteen animal heads laying on the floor, flies everywhere and meat just laying out in the sunshine on wooden benches. Of course we did find some fruit stalls right next to them, but decided on a more hygienic area of the market to by some. We ended up with both our arms full of fresh food and bread as we left the market for a local restaurant to do some people watching. After the limited wildlife in Murchison Falls we had decided not to go into the Queen Elizabeth National Park, especially when once all the costs are in they are equivalent to Kenyan parks, which are much better. We did go via the park on the way as it has main roads and even villages within its borders. Finding somewhere to camp outside the park was to prove a little tricky, it resulted in having to drive through a school and across the grassed grounds to get to a little lodge. It was yet another great setting with a view high up over the national park, where you could see elephants coming to drink. With the school being close and the fence being tiny it ended up with Katie having an depth discussions with a group of local boys, one who had an unbelievable camp persona, about how crazy it is that England does not have Rhinos or Elephants. 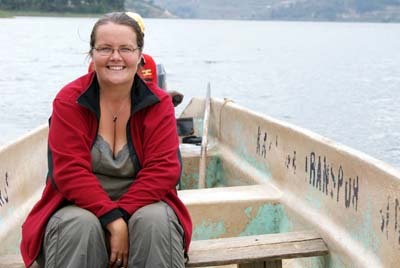 Our last few days in Uganda have been spent relaxing by Lake Bonyonyi and having an afternoon boat ride around the lake. The lake has many island dotted around as it used to be a valley till a near by volcanoes lava flow blocked the path of the river, resulting in the valley to be flooded. The island and mainland are all farmed right down to the waters edge and you can see the well worn walking trails guiding the locals over their farm. We even had our own little afternoon of entertainment that included singing, dancing and athleticism by some locals on the opposite bank to the camp with Katie joining in on our side.